Helen has led CeRDI's activities since 2002 and is responsible for the achievement of all CeRDI objectives in respect of research, project management, partner projects, business development and financial management. Under Helen's leadership, CeRDI has become one of Federation University Australia's most successful research centres, establishing a reputation for excellence at the regional, national and international level. Helen has university wide leadership for eResearch. 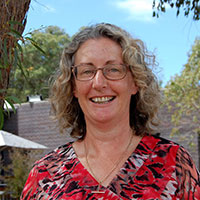 She is engaged in research into the use of ICT and is involved in a range of activities which contribute to the economic and social development of regional and rural Victoria. Thompson, H. (2005). Building Local Capacity via Scaleable Web-Based Services. In M. Khosrow-Pour (Ed), Encyclopedia of Information Science and Technology (Vol 1-V, pp. 312-317). Hershey, USA: Idea Group Publishing. Thompson, H. (2004). Creating and Sustaining Online Communities: Web-Based Services Meeting the Diverse Needs of Regional and Rural Australia. In S. Marshall, W. Taylor & X. Yu (Eds) Using Community Informatics to Transform Regions. Hershey, USA: Idea Group Publishing. Thompson, H. (2004). Helen Thompson Centre for Electronic Commerce & Communications (CECC) Manager. In M. Khrosrow-Pour (Ed) E-Commerce Security: Advice from Experts. Hershey, USA: Idea Group Publishing. Walters, J., Milne, R., & Thompson, H. (2018). Online farm trials: A national web-based information source for Australian grains research, development and extension. Rural Extension and Innovation Systems Journal, 14(1), 117-123. Thompson, H. (2005). A role for universities in sustaining regional ICT initiatives? Exploring the case of the University of Ballarat. The Journal of Community Informatics, 1(2), 151-164. Thompson, H. (2003). Growing exports via online communities and regional web-portals: A case study from the Central Highlands region of Victoria. Journal of New Business Ideas & Trends, 1(2), 44-58. Hansen, B., Pitfield, C., MacLeod, A., Novak, C., Nilsson, K., Dahlhaus, P., & Thompson, H. (2016). South West Climate Change Portal: using internet knowledge sharing and novel visualisations to engage community with climate science. Climate Adaptation 2016, 5-7 July 2016, Adelaide. Thoms, M., Reid, M., Gell, P., Thompson, H., Dahlhaus, P., Fabbro, L., Flint, N., Chapman, J., Baldwin, C., Clark, C., Sullivan, C., & Mushtaq, S. (2016). A Regional Universities Network Water Flagship. 'Working together to build strong Regional Futures' RUN Regional Futures Conference, 21-24 June 2016, Central Queensland University, Rockhampton. Murphy, A., Dahlhaus, P., & Thompson, H. (2016). Historic Urban Landscapes and Visualising Ballarat: Citizen Participation for sustainable urban planning and design. Locate 16: Distruptive Technology for a Smarter Society. 12-14 April 2016, Melbourne. Murphy, A., Thompson, H., & Dahlhaus, P. (2016). Making Intangibles Tangible: visualisation informing, engaging and empowering community for embedding cultural heritage within the public domain. EVAA 2016: Electronic Visualisation and the Arts Australasia 5-6 March, 2016, Canberra. Dahlhaus, P.G., Murphy, A., MacLeod, A., Thompson, H., & McKenna, K. (2015). Changing practices: the impact of making groundwater data visible through an interoperative web portal in Victoria, Australia. AQUA2015, 42nd IAH Congress, September 13-18, 2015, Rome, Italy. Thompson, H., Dahlhaus, P., Milne, R., Hansen, B., & MacLeod, A. (2015). The NRM planning portal: matching regional and local priorities to identify partnership opportunities in catchment management. Presented at Australian citizen science conference 2015. Maximising the capacity of citizen science for science and society, 23-24 July 2015., Canberra, Australia. Dahlhaus, P.G., MacLeod, A., McKenna, K., & Thompson, H. (2014). Creating virtual groundwater research laboratories through interoperable technologies. Paper presented at 41st IAH Congress on Groundwater : Challenges and Strategies, 15-19 September 2014, Marrakech, Morocco. Dahlhaus, P.G., MacLeod, A., McKenna, K., Milne, R., & Thompson, H. (2014). Online information to maximise soil health. Poster presented at Digital Rural Futures, Regional futures - Agricultural Futures - Digital Futures, 25-27 June 2014, University of Southern Queensland, Toowoomba, Queensland. Fong, G., Lindsay, J., Thompson, H., Judd, W., Green, A., Radoll, P., & Paton, A. (2014). Internet access and delivery of services to regional and rural communities. Workshop held at Australian Internet Governance Forum, 26-27 August 2014, Crown Promenade, Melbourne. Link to video recording. Milne, R., Dahlhaus, P.G., Nicholson, C., Thompson, H., MacLeod, A., Feely, P., McCue, T., Gillett, H., & Corbett, J. (2014). On-line farm trials: A research repository for Australian grain growers. Paper presented at Digital Rural Futures, Regional futures - Agricultural Futures - Digital Futures, 25-27 June 2014, University of Southern Queensland, Toowoomba, Queensland. Thompson, H., Dahlhaus, P.G., & MacLeod, A. (2014). The hype and the hope: Progressing towards big data insights for regional communities. Paper presented at Digital Rural Futures, Regional futures - Agricultural Futures - Digital Futures, 25-27 June 2014, University of Southern Queensland, Toowoomba, Queensland. Corcoran, J., Dahlhaus, P., & Thompson, H. (2013). It's all about the data - a 21st Century value proposition. Paper presented at 40th IAH Congress on Solving the Groundwater Challenges of the 21st Century, 15-20 September 2013, Perth, Western Australia. Link to Conference Poster. Dahlhaus, P., Macleod, A., & Thompson, H. (2013). Addressing the limitations of federated groundwater bore data. Paper presented at 40th IAH Congress on Solving the Groundwater Challenges of the 21st Century, 15-20 September 2013, Perth, Western Australia. Link to PowerPoint presentation. Dahlhaus, P., Thompson, H., & Macleod, A. (2013). Interoperable data - a researcher's dream? Paper presented at Digital Rural Futures conference on Smart Farms - Smart Regions, 26-28 June 2013. Armidale, New South Wales. Eime, R., Harvey, J., Thompson, H., & Feely, P. (2013). Sport and recreation spatial: development of a national geographical information system for the sport and recreation sector. Paper presented at Asics conference of Science and Medicine in sport, 22-25 October 2013, Phuket, Thailand. Macleod, A., Dahlhaus, P., & Thompson, H. (2013). Federating groundwater data for Victoria - the challenge of interoperability. Presented at Digital Rural Futures conference on Smart Farms - Smart Regions, 26-28 June 2013. Armidale, New South Wales. Link to Poster. Macleod, A., Dahlhaus, P., Thompson, H., James, A., & Cox, M. (2013). Web-based visualisation of 3d groundwater models. Paper presented at 40th IAH Congress on Solving the Groundwater Challenges of the 21st Century, 15-20 September 2013, Perth, Australia. Macleod, A.D., Feely, P., & Thompson, H.C. (2013). Spatial Representation And Visualisation Of Big Data. Workshop presented at Business Intelligence (BI) and Big Data Conference on Strategy to execution: Making data work for you by CeBIT Australia, 30 May 2013, Sydney, NSW. Thompson, H.C. (2013). Quality data capture and sharing of large datasets for public access. Presented at Digital information management and security conference, 20-21 February 2013, Canberra, ACT. Link to PowerPoint presentation. Thompson, H.C. (2013). Applied research projects utilising spatial technology. Paper presented at Department of Sustainability and Environment Newtech Conference, 21 March 2013, Colac, Victoria. Link to Abstract p.6. Thompson, H.C. (2013). Sustaining rural and regional knowledge through strong partnerships and new technology. Presentation delivered at Digital Rural Futures conference on Smart Farms-Smart Regions, 26-28 June, Armidale, NSW. Link to video presentation. Dahlhaus, P.G., Macleod, A.D., & Thompson, H.C. (2012). An interoperable federation of hydrogeological research data for Victoria, Australia. Paper presented at 39th IAH Congress on Confronting Global Change, 16-21 September 2012, Niagara Falls, Canada. Dahlhaus, P.G., MacLeod, A.D., & Thompson, H.C. (2012). Federating hydrogeological data to visualise Victoria's groundwater. In Lambert I. & Gordon A.C. (Eds) 34th International Geological Congress: Proceedings (Abstract #1382, p.592), 5-10 August 2012. Brisbane, Australia: Australian Geoscience Council. Link to Proceeding Report. Dahlhaus, P.G., MacLeod, A.D., & Thompson, H.C. (2011). UB Spatial - An Interoperable Groundwater Database. In Abstracts from 11th Australasian Environmental Isotope Conference & 4th Australasian Hydrogeology Research Conference (p.131), 12-14 July 2011, Cairns, Queensland. Link to Conference Poster. Thompson, H., MacLeod, A., & Dahlhaus, P. (2008). Spatial infrastructure, information access and knowledge building. In F. Burstein (Ed) ACKMIDS 2008: Proceedings of the 11th Australian Conference on Knowledge Management and Intelligent Decision Support, 8-10 December 2008. Ballarat, Victoria: University of Ballarat. Braun, P., Lowe, J., & Thompson, H. (2007). Cluster Governance: The Nexus between Local Conditions and Policy. Presented at Institute for Small Business and Entrepreneurship (ISBE) 2007 Annual Conference, 7-9 November 2007, Glasgow, Scotland. Lowe, J., Thompson, H., Lynch, D., & Braun, P. (2006). A Case Study of Clustering in Regional Australia: Public Policies and Private Action. In Heritage and Regional Development Refereed Proceedings of the 30th Annual Conference of the Australian and New Zealand Regional Science Association International (ANZRSAI), 26-29 September 2006, Beechworth, Victoria. Thompson, H., McEachern, S., & Marshall, C. (2006). New Learnings in Place-Based Employment Programs - Reflections on Research and Practice. Presented at PASCAL Fourth International Conference on Building Stronger Communities: Learnings, Governance, Directions, 13-14 July 2006, Melbourne, Victoria. Thompson, H., McEachern, S., & MacLeod, A. (2006). New Options and Opportunities for Spatial Informatics: Communicating Environmental Conditions and Intervention Impacts via the Web. Presented at Information, Communication and Society (ICS) 10th Anniversary International Symposium, 20-22 September 2006, University of York, York, United Kingdom. Thompson, H., McEachern, S., & MacLeod, A. (2006). Rhetoric and Reality: Reflections on Experience in the Diffusion of ICT-based community projects in disadvantaged communities. Presented at Information, Communication and Society 10th Anniversary International Symposium, 20-22 September 2006, University of York, York, United Kingdom. Thompson, H. (2005). Fostering Community Engagement and Participation Through Local Skills Audits: Exploring the Case of the Wendouree West Community Renewal Project. In M. Rogers (Ed) Refereed Proceedings for 2nd National Conference on the Future of Australia's Country Towns, 11-13 July 2005, Bendigo, Victoria. Ballarat, Victoria: VURRN Press. Thompson, H., & McEachern, S. (2005). Hidden Treasure: Unearthing Aspirations and Mobilising Skills in a Neighbourhood Renewal Context. In D. Gardiner & K. Scott (Eds) Proceedings of International Conference on Engaging Communities, 14-17 August 2005. Brisbane, Queensland: Queensland Department of Main Roads. Thompson, H. (2005). University Engagement and the Role of ICT in Building Communities and Social Capital. Paper presented at 2nd Australian Universities Community Engagement Alliance National Conference, 21-22 July 2005, Melbourne, Victoria. Thompson, H. (2005). Using Cluster Theory as the Lens through which the Results of Government Funded Online Service Initiatives can be Examined. Refereed paper presented at Centre for Regional Innovation and Competitiveness (CRIC) Cluster Conference 2005: Beyond Clusters: Current Practices and Future Strategies, 30 June - 1 July 2005, Ballarat, Victoria. Thompson, H. (2004). A Role for Universities in Sustaining Regional ICT Initiatives? Exploring the Case of the University of Ballarat. In G. Johanson & L. Stillman (Eds) Proceedings of CIRN Inaugural Conference and Colloquium, Sustainability and Community Technology: What Does this Mean for Community Informatics?, 29 September - 1 October 2004, Prato, Italy. Russia: Monash University. Thompson, H. (2004). Getting Online for a Good Yarn: Achieving E-Governance Strength Through the Active Participation of Citizens. In Proceedings of the Australian Electronic Governance Conference 2004, 12-13 April 2004. Melbourne Victoria: University of Melbourne. Knox, I., & Thompson, H. (2003). Connecting Communities: Connectivity Is Not Enough. Paper presented at International Academy of E-Business 2003 Conference, 3-8 January 2003, Melbourne, Victoria. In J. Van Beveren (Ed) The E-Business Review Volume III 2003. Melbourne, Australia: International Academy of E-Business. Thompson, H. (2003). Community Building via Online Communities and Regional Web Portals. Paper presented at Information Technology in Regional Areas (ITiRA), 15-17 December 2003, Caloundra, Queensland. In S. Marshall & W. Taylor (Eds) Refereed Papers from the 5th International Information Technology in Regional Areas Conference. Rockhampton, Queensland: Central Queensland University. Thompson, H. (2003). Growing Exports Via Online Communities and Regional Web-Portals: A Case Study from the Central Highlands Region of Victoria. Paper presented at Small Enterprise Association of Australia and New Zealand (SEAANZ) 16th Conference, 28 September - 1 October 2003, Ballarat, Victoria. Thompson, H. (2003). Strengthening Regional Communities through ICT and Online Capabilities - Getting Beyond the Regional Development Rhetoric. Paper presented at University of Ballarat Annual Research Conference, 5 November 2003, Ballarat, Victoria. Lowe, J., Thompson, H., & MacRae-Williams, P. (Eds). (2002). Research Forum Program Conference Letters from the 5th Global Competitiveness Institute Conference, Connecting Clusters, 9-11 October 2002, Cairns, Queensland. Ballarat, Victoria: Centre for Regional Innovation & Competitiveness (CRIC), University of Ballarat. Thompson, H. (2002). Achieving a Strategic Approach to Community Informatics Through University-Region Engagement. Paper presented at University of Ballarat 2002 Research Conference, 6 November 2002, Ballarat, Victoria. Thompson, H. (2002). Creating and Sustaining Online Communities-Replicable Web-Based Services Meeting the Diverse Needs of Regional and Rural Australia. Paper presented at OECD Victoria Learning Cities and Regions Conference, 14-15 October 2002, Melbourne, Victoria. Thompson, H. (2002). Delivering MainStreet.net.au Functionality Through 'Local' Community Portals. In S. Marshall, W. Taylor & C. Macpherson (Eds) Refereed papers from the 4th Information Technology in Regional Areas Conference, 27-29 August 2002 (pp. 141-149). Rockhampton, Queensland: ITiRA Conference Comittee. Thompson, H. (2002). Growth and Decline: Rejuvenating and Sustaining Regional and Rural Communities. In J. Lowe, H. Thompson & P. MacRae- Williams (Eds) 5th Global Competitiveness Institute Conference, Connecting Clusters, 9-11 October 2002, Cairns, Queensland. Ballarat, Victoria: Centre for Regional Innovation & Competitiveness (CRIC), University of Ballarat. Thompson, H. (2002). MainStreet.net.au-A Performance Evaluation. Paper presented at Electronic Networking 2002 - Building Community Conference, July 3-5 2002, Melbourne, Victoria. Thompson, H. (2002). A Strategic Approach to Community Informatics: The Role of Local Government. Paper presented at Centre for Regional Innovation and Competitiveness, Innovation, Enterprise and Regional Development Conference and Symposium, 22-23 August 2002, Ballarat, Victoria. Thompson, H. (2000). Capturing the Electronic Commerce Advantage: The Western Victorian Approach. In S. Klein, B. O'Keefe, J. Gricar & M. Podlogar (Eds) Proceedings from Thirteenth Bled Electronic Commerce Conference: The End of the Beginning (285-302), 19-21 June 2000, Bled, Slovenia: Moderna organizacija. Thompson, H. (1999). Victoria's Golden West Portal Project Business Case. Ballarat, Victoria: Centre for Electronic Commerce and Communications (CECC), University of Ballarat. Dahlhaus, P.G., & Thompson, H. (2017). EPA Victoria: A proposal for collaborative partnership in eResearch. Co-developing next generation data delivery and knowledge management systems. Ballarat, Australia: Centre for eResearch and Digital Innovation, Federation University Australia. Dahlhaus, P.G., & Thompson, H. (2017). Precision Agriculture: A proposal for collaborative eResearch in agriculture. A partnership to develop digital tools to enhance precision agriculture services. Ballarat, Australia: Centre for eResearch and Digital Innovation, Federation University Australia. Dahlhaus, P., & Thompson, H. (2016). Visualising Victoria's environment: Collaborative development of online tools for State of Environment reporting. Ballarat, Australia: Centre for eResearch and Digital Innovation, Federation University Australia. Dahlhaus, P., Thompson, H., Murphy, A., & Hansen, B. (2016). Waterwatch and EstuaryWatch portals: A collaborative research partnership to develop online tools to enhance citizen science, data collection and provision and information sharing. Ballarat, Australia: Centre for eResearch and Digital Innovation, Federation University Australia. Ollerenshaw, A., Murphy, A., & Thompson, H. (2016). Tenancy Research Report: Documenting the initial experiences of tenants in the Business Accelerator Program at the Western BACE. Ballarat, Australia: Centre for eResearch and Digital Innovation, Federation University Australia. Thompson, H., Corbett, J., & Fong, G. (2016). Great South Coast Digital Strategy: Final report. Ballarat, Australia: Centre for eResearch and Digital Innovation, Federation University Australia and Lateral Plains. Dahlhaus, P.G., & Thompson, H. (2015). Cotton Research and Development Corporation - eResearch knowledge base: Online data and tools to enhance Australian cotton research. Ballarat, Australia: Centre for eResearch and Digital Innovation, Federation University Australia. Dahlhaus, P.G., & Thompson, H. (2015). Water for Australian agriculture: Short concept proposal - Visualising Australia's groundwater. Ballarat, Australia: Centre for eResearch and Digital Innovation, Federation University Australia. Ollerenshaw, A., Murphy, A., McDonald, K., & Thompson, H. (2015). Western BACE Partnership Research Report 2015. Ballarat, Australia: Centre for eResearch and Digital Innovation, Federation University Australia. Ollerenshaw, A., Thompson, H., & McDonald, K. (2015). Western BACE Community Survey: Research Report 2015. Ballarat, Australia: Centre for eResearch and Digital Innovation, Federation University Australia. Ollerenshaw, A., Thompson, H., & McDonald, K. (2015). Western BACE research, monitoring and evaluation: Business innovation survey report 2015. Ballarat, Australia: Centre for eResearch and Digital Innovation, Federation University Australia. Dahlhaus, P.G., & Thompson, H. (2014). Corangamite eResearch. A collaborative research partnership to develop online tools that will enhance community engagement in catchment management in the Corangamite region. Ballarat, Australia: Centre for eResearch and Digital Innovation, Federation University Australia. Dahlhaus, P.G., & Thompson, H. (2014). GRDC eResearch: Online knowledge base, research data and tools to enhance Australian grains research. Ballarat, Australia: Centre for eResearch and Digital Innovation, Federation University Australia. Dahlhaus, P.G., & Thompson, H. (2014). Visualising Ballarat - past, present, future. A collaborative research proposal to develop online tools to support Ballarat's Historic Urban Landscape program. Ballarat, Australia: Centre for eResearch and Digital Innovation, Federation University Australia. Dahlhaus, P.G., Thompson, H., McKenna, K., & Milne, R. (2014). Building resilience in farming and agribusiness - Victorian adaptation sustainability partnerships. Literature review and gap analysis. Ballarat, Australia: Centre for eResearch and Digital Innovation, Federation University Australia. McDonald, K., Ollerenshaw, A., & Thompson, H. (2014). Western BACE review of regional demographics. Ballarat, Australia: Centre for eResearch and Digital Innovation, Federation University Australia. Ollerenshaw, A., Dahlhaus, P.G., McDonald, K., Courvisanos, J., Graymore, M., Thompson, H., Sheil, H., Miner, A., & Corbett, J. (2014). Understanding the 2011 Grampians natural disaster, addressing the risk and resilience. Ballarat, Australia: Centre for eResearch and Digital Innovation, Federation University Australia. Thompson, H., & Ollerenshaw, A. (2014). Year 2 research monitoring and evaluation for the Western Business Accelerator and Centre for Excellence (BACE). Ballarat, Australia: Centre for eResearch and Digital Innovation, Federation University Australia. Thompson, H. (2013). Central Highlands agribusiness forum: Green monitor energy and environmental monitoring and management system evaluation. Ballarat, Australia: Centre for eCommerce and Communications, University of Ballarat. Thompson, H. & Ollerenshaw, A. (2013). Centre of Excellence Research Group: Western Business Accelerator and Centre for Excellence Research and Evaluation Plan. Ballarat, Australia: Centre for eCommerce and Communications, University of Ballarat. Thompson, H. (2012). Birchip Cropping Group wildlife ponds scheme - Web 2.0 Tools for emerging technologies supporting engagement and monitoring or enhanced biodiversity values. Ballarat, Australia: Centre for eCommerce and Communications, University of Ballarat. Thompson, H. (2011). Wimmera eMentoring feasibility study: Final Report. Ballarat, Australia: Centre for eCommerce and Communications, University of Ballarat. Thompson, H., Eime, R., & Corbett, J. (2011). Australian Sports Commission sport eLearning survey results. Ballarat, Australia: Centre for eCommerce and Communications and School of Health Sciences, University of Ballarat. Thompson, H., Fong, G., & Corbett, J. (2011). Great South Coast Regional Communication Strategy: Getting connected to the NBN. Ballarat, Australia: Centre for eCommerce and Communications, University of Ballarat and Lateral Plains. Thompson, H., Fong, G., Corbett, J., & Fong, B. (2011). Wimmera Southern Mallee ICT study. Ballarat, Australia: Lateral Plains and Centre for eCommerce and Communications, University of Ballarat. Thompson, H., Fong, G., Corbett, J., & Fong, B. (2011). Wimmera Southern Mallee ICT survey results. Ballarat, Australia: Lateral Plains and Centre for eCommerce and Communications, University of Ballarat. Thompson, H. (2010). GippsLink project: Strategic plan for Gippsland Regional Geographical Information System (GIS). Ballarat, Australia: Centre for eCommerce and Communications, University of Ballarat. Thompson, H., Fong, G., Corbett, J., & Fong, B. (2010). Central Highlands ICT study. Ballarat, Australia: Lateral Plains and Centre for eCommerce and Communications, University of Ballarat. Thompson, H., Fong, G., Corbett, J., & Fong, B. (2010). Central Highlands ICT survey results. Ballarat, Australia: Lateral Plains and Centre for eCommerce and Communications, University of Ballarat. Thompson, H., Fong, G., & Fong, B. (2010). Moorabool community broadband and telecommunications strategy. Ballarat, Australia: Lateral Plains and Centre for eCommerce and Communications, University of Ballarat. Marshall, C., & Thompson, H. (2009). Fitzroy Legal Service - The Law Handbook: Understanding current and potential users. Ballarat, Australia: Centre for eCommerce and Communications, University of Ballarat. Thompson, H. (2009). Leo Cussen Institute website redevelopment options. Ballarat, Australia: Centre for eCommerce and Communications, University of Ballarat. Yearwood, J., Lowe, J., Thompson, H., Lynch, D., & Martin, K. (2007). Ballarat ICT 2030: A strategy and plan for the future. Ballarat, Australia: Centre for Informatics and Applied Optimisation, Centre for Regional Innovation and Competitiveness and Centre for eCommerce and Communications, University of Ballarat. Knox, I., & Thompson, H. (2003). e-Commerce exhibition project. Ballarat, Australia: Centre for Electronic Commerce and Communications, University of Ballarat. Thompson, H. (2002). Final Report: MainStreet.net.au regional portal. Ballarat, Australia: Centre for Electronic Commerce and Communications, University of Ballarat. Thompson, H. (1999). Victoria's Golden West Portal Project Business Case. Ballarat, Australia: Centre for Electronic Commerce and Communications, University of Ballarat.